Shapes, color and spatial awareness meet in an activity that will make children chirp for joy! Learn about contrasting colors by creating a three-dimensional artwork out of your own collage paper. Then, build a sturdy base strong enough to display it. Contact local frame shops to acquire board mat scraps. 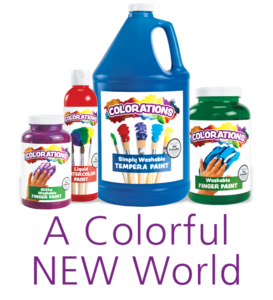 You may choose to paint with BioColor® for a bold color, or foam paint that does not need to dry. Children will need large sheets of white paper, paint in a variety of colors, scissors, collage items for decorating and either mat board or cardboard to serve as the base and legs. With all items distributed, let children's imaginations take flight! Cut a sheet of heavy white paper in half and paint each half with different colors. Allow the paper to dry until it can safely be cut with scissors. Fold one sheet in half and cut a large heart shape from the folded, painted paper. Then, cut out a head, beak and wings from the other painted sheet. Use glue to assemble the complete bird shape together. Add feathers, eyes, wings and any other details desired. Leave the bottom of the bird free to add legs. Cut mat board into a 4" square base and two 1/2" x 4" strips for legs. Use tacky glue to adhere the strips to the bottom of the bird and the base. While children should be aiming for a bird design with somewhat regular shapes, allow them to experiment with their designs for wings, beaks and accessories. Discuss their color and shape choices with them. Ask about how three-dimensional art is different from two-dimensional art. Create eye-pleasing contrast by using warm colors such as brown, orange, yellow pink and red on one sheet of paper, and cooler colors such as white, turquoise, blue, purple, green and black on the other. 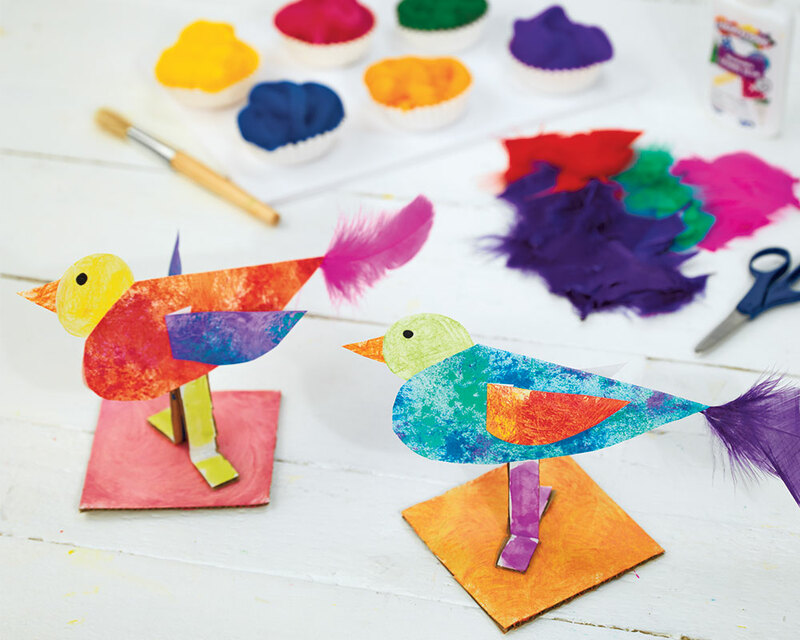 These colorful birds can easily become part of a puppet show! Create a small stage to display the birds and create a scene for the children to speak for their birds.